Why, hello there! This post might contain affiliate links, which means I earn a commission (at no extra cost to you!) if you purchase from them. Despite being a smaller city compared to Saigon or Hanoi, I found Hoi An to be the perfect place to travel sustainably. 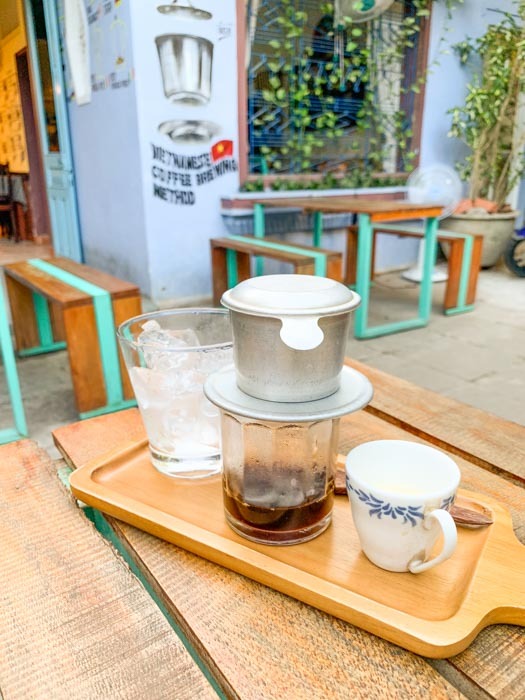 To help other travelers visiting Hoi An, I’ve put together a guide to responsible travel in Hoi An. If you want to support local communities and shop at boutiques where everything is ethically made, read on my friends! 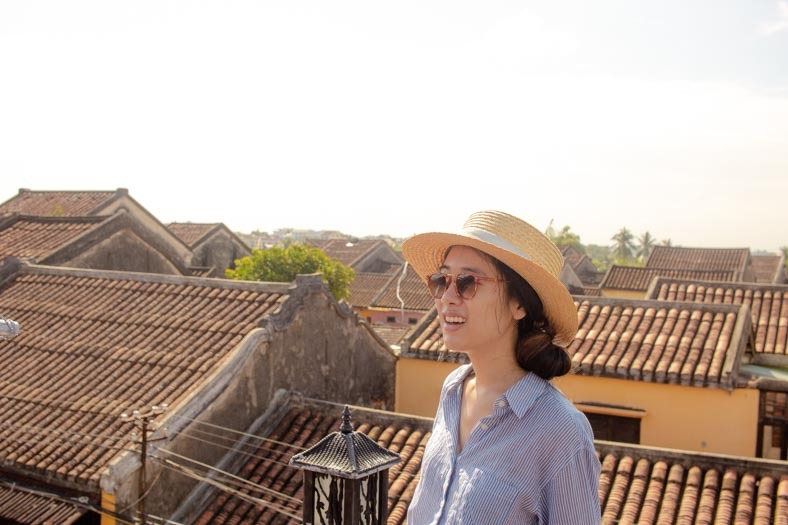 This guide to responsible travel in Hoi An will cover my travel experiences. I hope that my experiences help other travelers who want to travel responsibly. Note: My Zero Waste travel guide to Vietnam will include more general advice on traveling around Vietnam zero waste (e.g. tips for getting safe drinking water that doesn’t involve plastic bottles). If you want more tips for zero waste travel in Vietnam, check out my guide! But why should you visit? Hoi An served as a trading port from the 15th to 19th centuries and as a result, the architecture is a mix of local and foreign influences, making it a unique snapshot of Vietnam’s history. Hoi An is one of the most beautiful cities in Vietnam, and thus one of the most popular with visitors and locals alike. The unique architecture resulted in Hoi An’s old town being declared a UNESCO world heritage site in 1999, and you can see the work and effort that has gone into preserving the history that exists here. 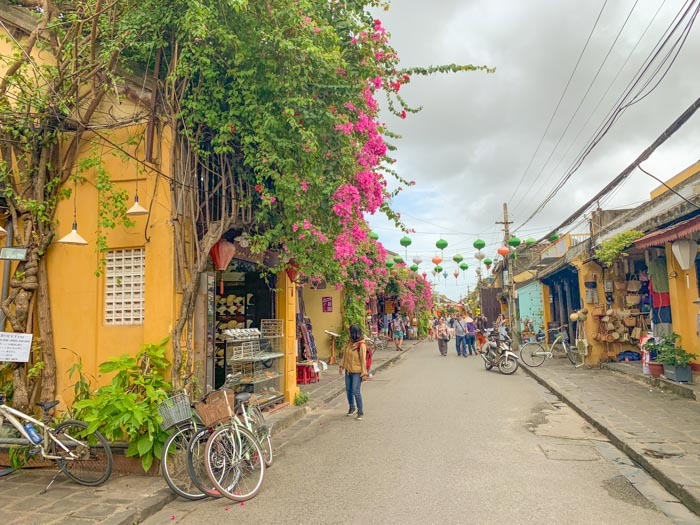 The Old Town is the most notable part of Hoi An, and when people tell you how much they loved Hoi An – they’re most likely referring to the Old Town. Entrance costs 120,000 VND (USD 5) per person and includes entrance tickets to your choice of 5 out of 22 available points of interest. I’d recommend researching ahead what you want to see first. When we paid for our tickets, we were told they were valid for 3 days (the ticket, however, said it was valid for 24hrs). We were able to use them for the 3 days we were in Hoi An. However, ticket enforcement is inconsistent at times. There have been instances of tourists refusing to pay the entrance fee for the old town. 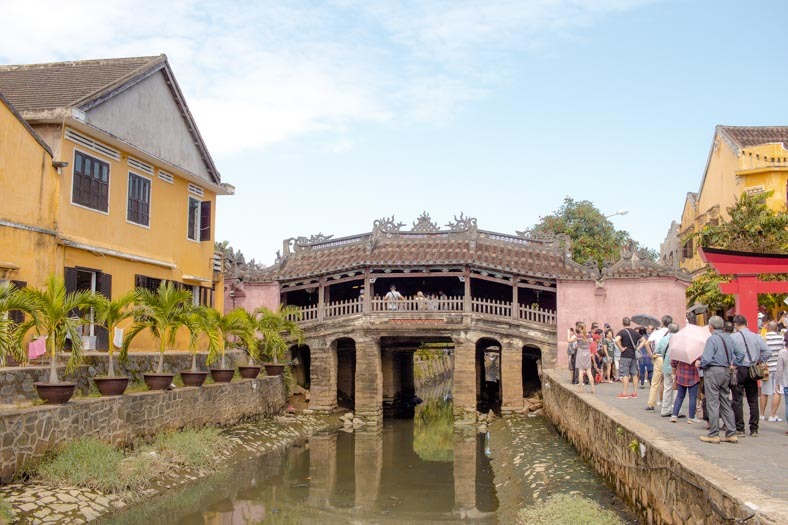 While most Old Towns in other cities do not require payment, the money raised from this endeavor is to go towards the maintenance and restoration of the Hoi An’s Old Town. While this fee adds to your travel costs, unfortunately as tourists our mere presence contributes to the degradation of the places we visit. The entrance fee is a small amount that we can contribute to reducing this as much as possible. Local boutique or family-owned hotels are the best options for when you’re looking for a hotel in Hoi An. Fortunately, there aren’t many (if at all) chain hotels here. We always recommend staying at locally owned hotels to make sure your hard-earned tourist dollars make it to residents. Homestays are also a great way to experience local culture and stay with a local family. 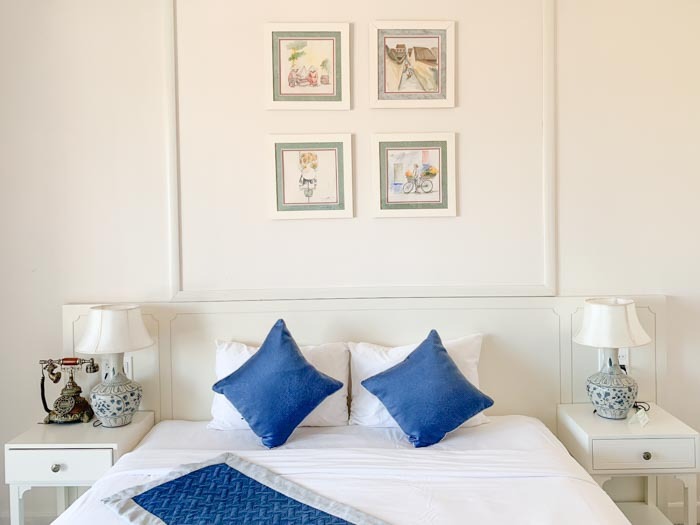 There are also a couple of homestay options in Hoi An (unfortunately these were fully booked when we planned our trip!) If you’re interested in homestay options, make sure you book in advance! 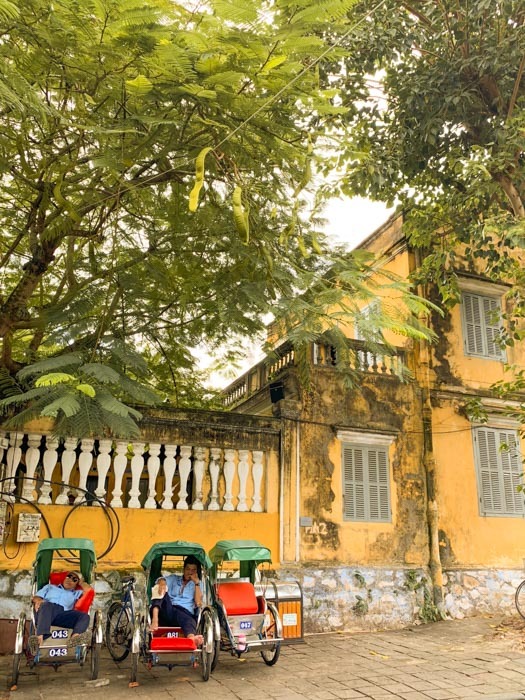 If you stay around the old town, most of Hoi An’s notable spots are accessible via foot, or bicycle (these are about USD 1 per day to rent) or motorbike (USD 4-5 per day). The traffic in Hoi An can get pretty busy, so I only recommend bicycles and motorbikes for confident riders. There are also a couple of accommodation options by the Thu Bồn River, which makes the old town a 15-20min walk away. We stayed in this area, but rented bikes and the path along the river is relatively quiet, flat and straight. Our accommodation also had a shuttle bus available, which you had to book 1 hr in advance. We used this in the evenings when the shuttle was busy with our fellow hotel guests. Once you’re in the old town, everything is accessible on foot. You can ride your bike here as the Old Town is closed off to cars during most of the day. Given the crowds though, I wouldn’t recommend this unless you’re a confident bike rider. A note on traveling with minimal plastic consumption (before we get to restaurant suggestions! ): Hoi An is first and foremost a tourist town. Because of this, you will find that most cafes/restaurants in the Old Town have excellent English skills. If you have specific requests (especially around plastic straws) most servers will understand what you mean – it’ll just be a matter of the person preparing your drink to remember! STREETS provides professional-level training and apprenticing to impoverished youths in Vietnam. This training supports the start of their careers in the culinary arts and hospitality service, which is a growing sector in Vietnam. We had the Vietnamese tasting menu. While this was expensive for Vietnam, the food and service were of excellent quality. Phinh Coffee was my favorite coffee shop in Vietnam. Hidden down a narrow alleyway (yes, you might get lost trying to find this place!) They take their coffee very seriously here. Make sure you order the house special, and you won’t be disappointed. I’m not a huge coffee drinker (coffee usually gives me a throbbing headache), but I’m glad to say I didn’t get a headache AND the coffee tasted amazing! For my fellow travelers who want to reduce their plastic consumption, cold drinks here are served with paper straws – a small detail but appreciated none the less! 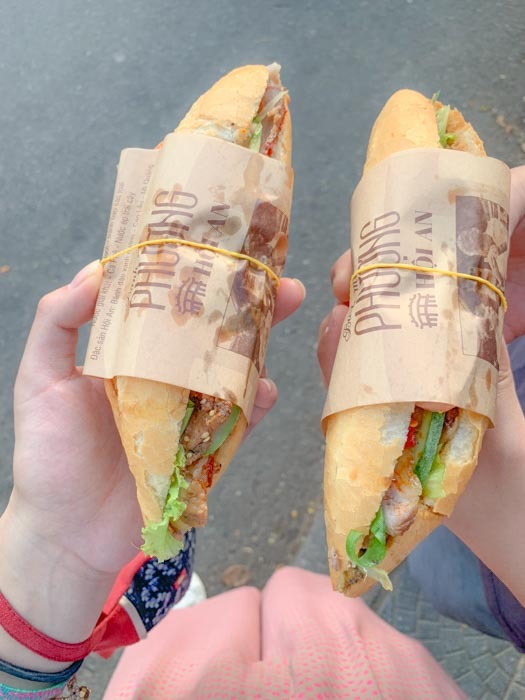 I would be remiss if I didn’t mention one of the best Banh Mi eateries in Vietnam. Featured on Anthony Bourdain’s Parts Unknown, this little shop has pretty long lines! For my vegetarian friends out there, they even have a vegetarian option! If you’re traveling zero waste, ask to eat in – your Banh Mi will be served on a plate sans plastic and paper. If you need to get takeout, the Banh Mi is served with a paper wrap, tied with a rubber band and plastic bag. We were able to avoid the plastic bag but didn’t say no in time to avoid the rubber band and small paper wrap. While not strictly eco-friendly (I forgot to ask for my drink without a straw here) Faifo coffee has a rooftop level with amazing views of Hoi An. You’ll need to order a drink to head up, but it is well worth the beautiful views. Hoi An is a shoppers heaven. 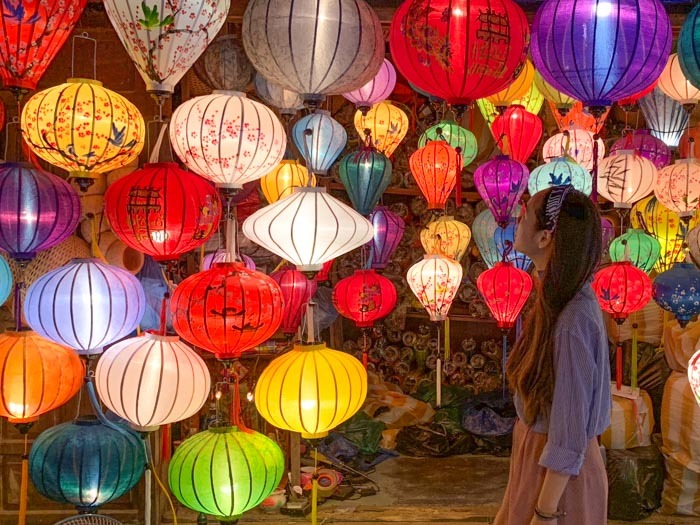 Known for handmade lanterns, tailored clothing and shoes, you’re bound to find something you like in Hoi An. In this guide, I’ve put together ethical shopping options in Hoi An that I visited while I was there. If you know of others, please leave me a comment, and I can add them to the guide! Located in Hoi An old town, this organization supports disabled Vietnamese artisans. Reaching out arts and crafts is locally own, where all their products are locally made, and they are fair-trade. They sell a wide selection of homewares (pillowcases, placemats, plates, teapots), beautifully made jewelry and a small selection of ethically-made clothes. All clothes at Metiseko are made ethically in Vietnam from 100% organic cotton or refined silk from the central highlands in Vietnam. Their workers get fair pay, good working conditions, health insurance, and free English or French language lessons. Pricing here, while is expensive for Vietnam standards, is still affordable compared to fair trade, organic cotton options in the US or Australia. A skirt here cost me approximately USD 100. Note: this was my favorite store in Hoi An. I liked that the materials were sustainably sourced too, and they organic cotton dyeing and printing processes are AZO (acid) free, which means it is not harmful to the garment makers. Most of their products use traditional textile techniques, with information about these techniques displayed on posters in their shop. Village Craft Planet stocks homewares (e.g., pillowcases) and ethically made clothes (including children’s clothing). Most tailors work to a quick turnaround. They guarantee they can make whatever you need within 24 – 48hrs. If you’d like to get anything made, make sure provide as much time as possible. This reduces any crazy hours the tailors need to work and ensures a better fit, as you can have additional fittings. Also, make sure to choose tailors that are open about their workshops. Ask if you can see where the clothes are made. A note on price: you get what you pay for. Not that a higher price gets you better quality all the time, but if you are driving down the price, you have to wonder where corners will be cut. Will workers get paid less? Will you get a low-quality garment? Feel free to haggle (no one wants to get ripped off!) but keep in mind the implications of the price. 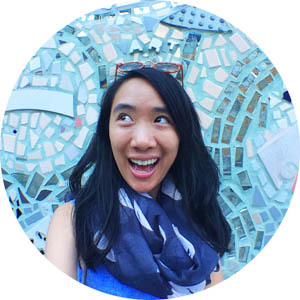 So there you have it – my Hoi An responsible travel guide! Hoi An was one of my favorite cities to visit in Vietnam. For shopping lovers, there is a great selection of ethical shopping options all walking distance to each other. I’d love to hear from you: what did you think of my guide to responsible travel in Hoi An? 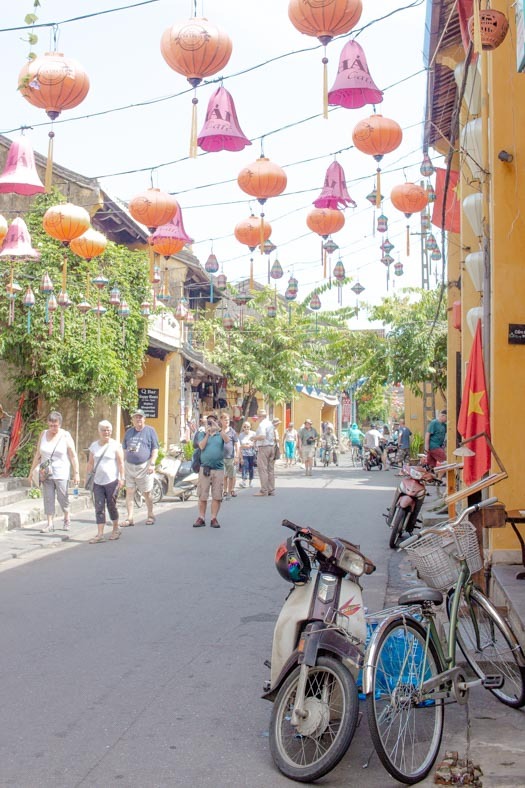 Have you been to Hoi An? Did you enjoy it? Or are you including Hoi An on your trip to Vietnam? 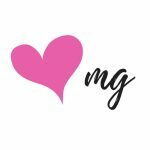 Hi, I’m MG! I’m an Aussie girl who’s been lucky enough to live in Boston and Tokyo. I have an on-going love affair with Japan (shhh don’t tell my husband!) and I’m obsessed with sushi, washi tape and eating my body weight in ramen. Click the button below to learn more about me! Want to follow my adventures? 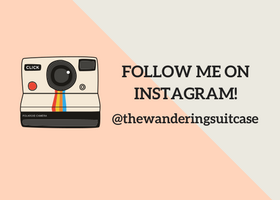 Click the image below to follow me on Instagram @thewanderingsuitcase. Here, I share my awkward travel moments, late night ramblings and lots of colorful + bright travel photos!